Lamp emits UV rays of 254nm and can kill most germs and microorganisms. Emits no ozone. Germicidal lamps are clear with special UV transmitting glass. For use in sterilizers and air and water purifiers. This is an ultraviolet C (253.7 nm wavelength) bulb for use in sterilization, water and air purification and surface disinfection. Used in the Forming and Disinfection of Contact Lenses. Used in UV Sterilizers for Fish Aquariums and Ponds. 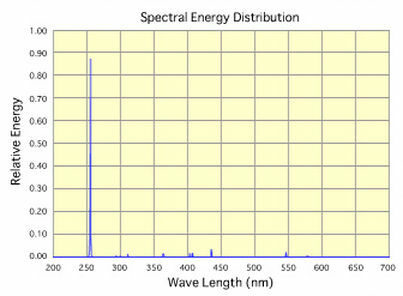 Fixed wavelength spectrophotometer detector. Germicidal lamps allow 253.7nm UV-C radiation from the mercury discharge to pass through the glass thus penetrating and inactivating the DNA of most micro-organisms. Warning: Avoid direct exposure of eyes and skin under germicidal lamps. To prevent possible serious injury, eyes and skin should not be exposed to direct or reflected ultraviolet power emitted by this lamp. This lamp is in Risk Group 3 per ANSI/IESNA RP-27.3-96. Adequate protection should be provided by clothing, gloves, opaque materials, and ordinary window glass. Although this lamp will operate in standard fluorescent fixtures, it should not be used for general lighting applications. Go to our Germicidal Safety Sheet for more lamp handling details. Note: This lamp contains Mercury. Manage in accord with disposal laws. See www.lamprecycle.org. Germicidal fluorescent light bulbs are most often used with specialty air and water purification systems in hospitals, food handling, and HVAC. Applications include food processing, medical facilities, air conditioning systems, pharmaceutical production, clean room, drinking water, photochemistry, phototherapy, dermatology, wastewater, laboratory/research, and other sterilization and disinfection needs. For use only in fixtures and equipment designed for germicidal lamps.